Businesses often use CRM (Customer Relationship Management) technology without a clear understanding of why they should use it, or even what it is. As a CRM professional, I often have trouble explaining to people what it is I do. My mother-in-law, in her mid-60s, understood when I told her, “Imagine if your Rolodex automatically kept track of every contact and every meeting you had with the people you dealt with in your business, and let you search within all that information for things you need to know” (she’s a smart lady, but she’s not a data professional). Since we at Caldere are professionals who use, maintain, and administer data, and you probably are too if you are reading this blog, we need to understand CRM a bit more technically. Customer Relationship Management (CRM) is a strategy for managing all your company’s relationships and interactions with your customers and potential customers. CRM technology allows firms to collect and manage large amounts of customer data and then carry out strategies based on that information. Data collected through focused CRM initiatives help firms solve specific problems throughout their customer relationship cycle—the chain of activities from the initial targeting of customers to efforts to win them back for more. Clearly CRM technology is something that modern businesses need if they are to keep up with the information they gather daily about the people who are most important to them. Are you one of those people who has to have the latest TV and mobile phone, and perhaps a cool laptop to take to the coffee shop, but in your office you make do with collections of business cards and 3-ring binders full of notes? 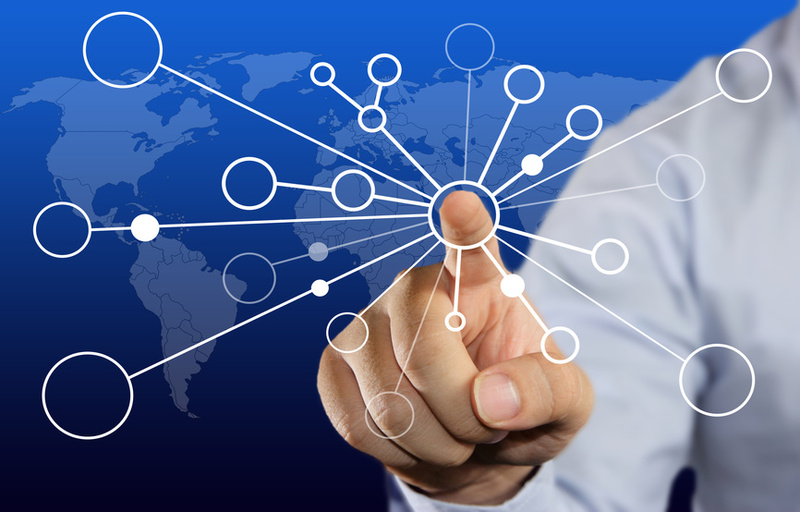 CRM technology is as critical to business as Google is to using the Internet. You can’t tap a phrase into a file cabinet and have it arrange your information so that it shows just the contacts who meet your criteria. You can send a paper marketing mailout, but you won’t get the attention of people who check their email twenty times for every time they check their post. Office administrators know how vulnerable your paper notes are to being mislaid, misorganised, or discarded. IT professionals, similarly, know how vulnerable data is even when it is stored on your laptop or desktop, or on your office server. Servers can crash. Hard drives can fail. But a good CRM solution, administered by a good CRM provider, will be structured in a secure manner on servers that are maintained and backed up regularly. 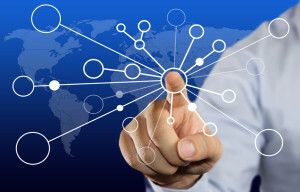 The advent of cloud computing brings you data anywhere and anytime, so long as you can access a connection. No matter where you are in the world, the critical customer data you gather is immediately accessible to your colleagues in every other location where you do business. Similarly, customer and client information does nobody any good when it is locked into separate laptops accessible only to single users. Emails are usually stored in a single system, but are invisible to other people who work with the same clients. Communicating through a CRM system allows everyone in your organisation to see and keep up with what is happening to your relationship with a given client. Nobody has to look unprepared or uninformed because they missed the latest discussion or a critical meeting. Every piece of information can be made available to everyone who needs to know. There’s really no good way to look back into the history of your relationship with a customer without using CRM technology. If you want to look back in time and understand how things have progressed, you need a solution that tracks all of their communication… their sales history… their feedback… their issues. You’ll be able to save clients by knowing how to anticipate their needs and forestall common problems. You’ll be able to create marketing materials based on purchase and communication history. Using what you’ve learned about the relationship you have with your customers, you can make your business into a responsive and confident authority. 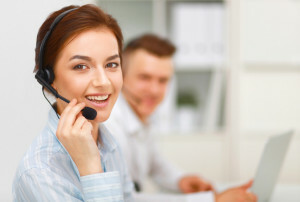 You can design programs that give your customers the right kind of customer service experience. You can get sales and support staff talking to each other so that they can work together to give customers what they only guess they’ll need next. You can use customer feedback to tell you where your resources are best spent. You can use past sales history to suggest what potential maintenance issues a customer might be facing. In addition, you can plan your time using built-in calendar and task management so that every process is done right the first time. Once you understand the past, and know what to do in the present, you will have a reasonably good idea what your efforts now will give rise to in the future. Things that used to come as complete surprises will be explainable, and you can plan for them, when you know why and how they happened. The better your data is in your history, and the better you track your campaigns, projects, and events, the more you can know about what is likely to happen in days, weeks, or months… with respect to individual clients, client companies, locations, or entire markets with which you have a relationship. New technology such as Business Intelligence (BI) can give you even more detailed predictive analysis to make the future much easier to plan for and to help you ask the right questions of your valuable data. How can my company get more out of CRM? Every company has some sort of customer relationship management system, even if it’s just a few accounts held in the CEO’s memory. Caldere, experts in CRM technology, can help you evaluate your current system and show you ways to better organise your data so it is more transparent and accessible. Effective, powerful solutions are available for every type of organisation. No organisation can afford to fall behind when it comes to managing their relationships with their customers. Contact us for a meeting and demonstration so we can show you what the current state of the technology is, and find the best solution for your needs. Why should I use Web Info when I already use Social Updates? In our previous post, we showed you a quick and simple way to link your contacts’ Facebook and Linked In social media profiles to their record in your Act! CRM database by using the Social Updates tab. But your contact has more online presence than a Facebook and Linked In account. They use email. They have a personal or professional website. They have a physical location where they might meet with you. Other people might write about them, such as investment sites or feedback forums. You can link to all this by using the Web Info tab. Like the Social Updates tab, the Web Info tab uses Internet Explorer to open the Internet information you want to associate with your contact. All it takes is a few clicks. You can even tell Act! to link to additional information you specify (I’ll be covering this in an upcoming blog post). All of this will be included in your contact record and accessible from within Act!. Sounds good! How do I do that? 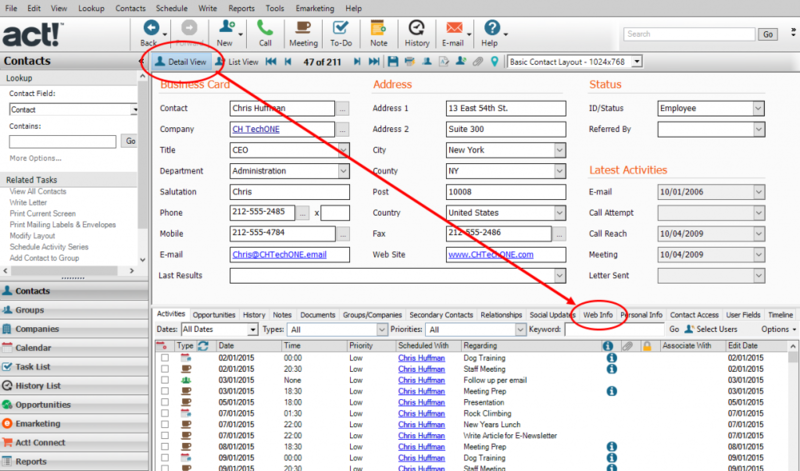 Start by accessing your contact’s record in your Act! CRM database. Login to your Act! database. 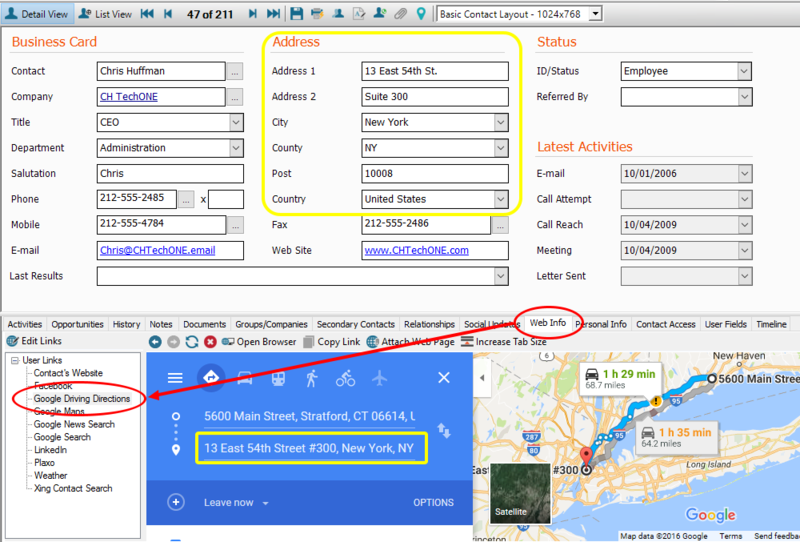 Navigate to the Detail View of a contact whose Internet information you wish to view. Click the Web Info tab. Choose one of the User Links on the left side of the tab to view that page on the Internet. In the example below, I’ve chosen Google Driving Directions. Act! entered the contact’s address automatically as the destination (yellow rectangles), and I entered the starting point. Contact’s Website will bring up the URL of the contact if it is listed in the Web Site field, and if the page is working (the example site is real, but there is no information in it). Google Maps will automatically show you the location in the Address fields. Google News Search will bring up a search in Google News with your contact’s name (the Contact field) as the search term. Google Search will perform a basic Google search on your contact’s name. For other choices under User Links, you may need to enter some information when Web Info brings up the web page. You may already have Facebook and LinkedIn configured on the Social Updates tab, but they will not necessarily be configured the same way here. How do I change what I see on this tab? There are some controls at the top of the tab that allow you to work with what is presented. The four buttons at the top of the tab are the same as Back, Forward, Reload, and Stop Load in your regular browser. Choosing Open Browser will open an external instance of Internet Explorer to the selected page. Copy Link will copy the URL of the selected page so you can paste it into a different browser or into a document. If you have opened a search result from one of the search pages, or navigated to an interesting web page, clicking Attach Web Page will insert the selected URL into your contact’s History so you can refer to it later. Clicking Increase Tab Size temporarily increases the height of the tab so that it covers the Detail Page information and gives you better visibility of the web page. When the tab is expanded, Increase Tab Size changes to Decrease Tab Size. Clicking Decrease Tab Size resets the tab to its original size. That’s great as far as it goes, but didn’t you mention I could include additional information? Yes, you can customise your User Links! You can change existing links, use existing links as templates to make similar links based on different fields, or add new links based on useful information. Since this functionality is a bit more complex and some changes involve simple coding, I’ll cover that in another post. You’ll access this functionality through Edit Links. Click this link to access the next post about how to use Edit Links to add more info to your Web Info! Swiftpage support is being discontinued for Act! v16! Beginning in December 2016, Act! v16 customers will be unable to purchase additional licenses for Act! v16. Swiftpage will stop supporting this version. As we approach this date, users of Act! v16 should consider this the right time to upgrade to Act! v18 and take advantage of better functionality, resolutions of known issues, and continued Swiftpage support. What’s in the new upgrade? Increased compatibility with platforms we use every day, such as Windows 10 and Office 2016. New features and enhancements introduced in later versions. Connection to hundreds of business-critical tools and applications, including PayPal, using Act! Connect. Numerous improvements to performance and usability, introduced to increase efficiency and enhance your user experience. To discuss the best upgrade options for your business, contact us now! Limited time loyalty pricing ends November 30, 2016. Flexible pricing and deployment options are available. Please call +44 (0)118 945 6220, email info@caldere.com, or use the message form to contact us via the site.